During this time we were awarded a twenty week contract with Laing for Land Reclamation and Remediation works at the previously demolished Hams Hall Power Station. 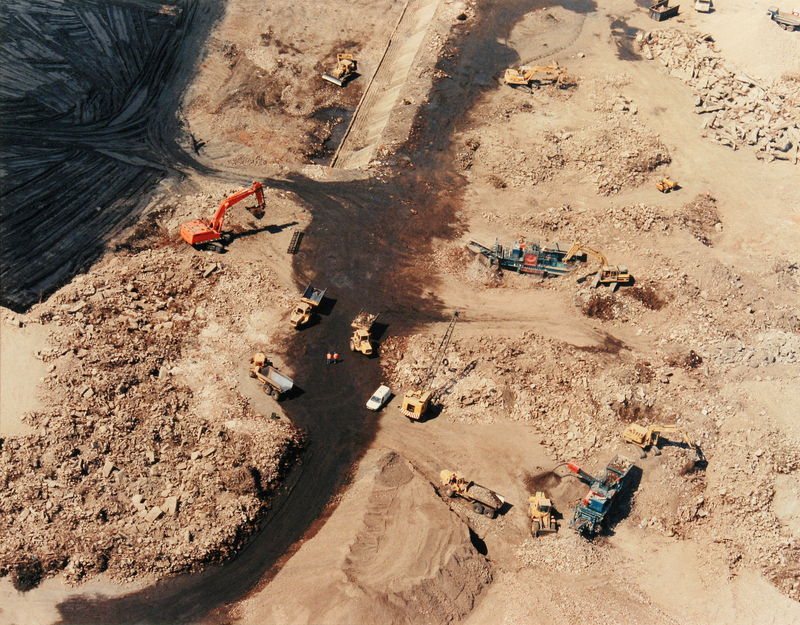 The works were to excavate demolition arisings that had been indiscriminately deposited in the old abandoned fly ash lagoons, crush and process same that were then to be reused as fill and capping materials. The demolition arisings were mainly heavy reinforced concrete, some lumps weighing upto 20 tonnes. We recovered in excess of 3000 tonnes of steel reinforcement from the materials recovery and processing with our crushing plant which paved the way for our state of the art recycling facility at Shady Lane. An ariel view of our land reclamation and remediation contract at Ham’s Hall Power Station, West Midlands. The plan was to then obtain suitable P.F.A. from stockpiles, haul to the excavated lagoons, deposit and compact to levels to receive processed demolition arisings as specified capping. We devised a method of work that would eliminate all the “double handling” of materials, saving both time and money. Our contract was being continually extended to include additional land reclamation of areas of the site that had been used to deposit and bury fibrous asbestos materials, to pump out and reclaim old abandoned lagoons and settlement tanks. One variation was to excavate and remove 110,000m3, a distance of 1km spread and level to new contours within 30 days, which was during November 1996. Such was our flexibility; we were both confident and positive in our capabilities of meeting and delivering our commitments. We also created new roads and hard standings; we demolished many varying forms of buildings and underground structures. We remained on site for a period in excess of two years; nothing was ever too much trouble, as we continued to offer a one stop comprehensive demolition, excavation, reclamation and remediation service. Towards the end of the decade, we won a fairly innocuous industrial demolition of Victorian one and two storey buildings, followed by the site remediation in Balsall Heath, Birmingham. Once we had taken possession of the site we discovered dipping tanks, within the buildings, some full of acid, others cyanide, on closer examination of the structure we discovered, to our horror that, there was a thick layer of cyanide dust on the steelwork and timber joists, the whole works area was to be subject of a thorough environmental clean prior to any demolition works starting. The client was not happy at the additional costs and delays that were going to be involved, as only three weeks previous the factory had been in full production!!! We insisted that we wanted the site to be a safe place of work for our personnel. This was not the only difficulty that we came across, there were hidden asbestos covered boilers, sealed pits full of toxins, our experience soon demonstrated that we knew what to look for and where to find the dangers. The project was completed a week late, without incident or accident. Why not learn more about our specialist reclamation and remediation services in addition to our asbestos removal services? This entry was posted in Aggregate production and supply, Earthworks, Land Reclamation, Land Remediation, Recycling. Bookmark the permalink.